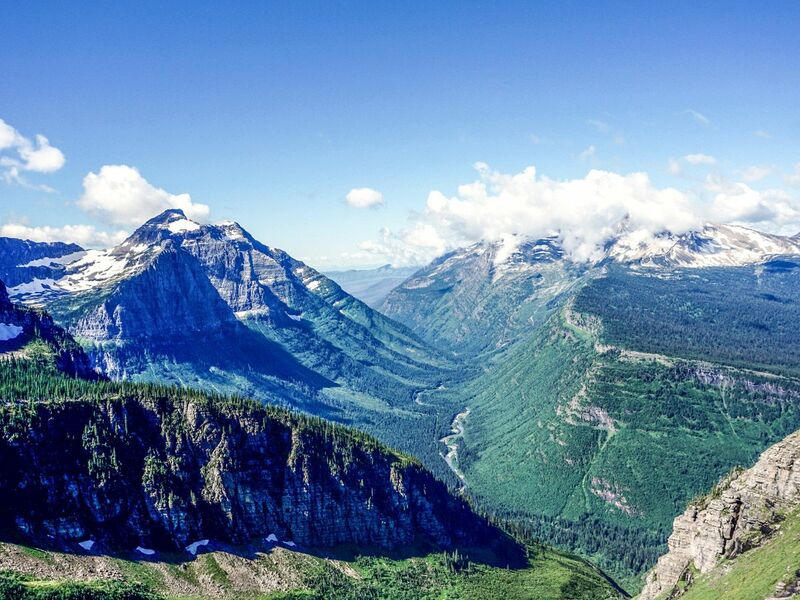 The Highline is one of Glacier’s legendary hikes along the Continental Divide. 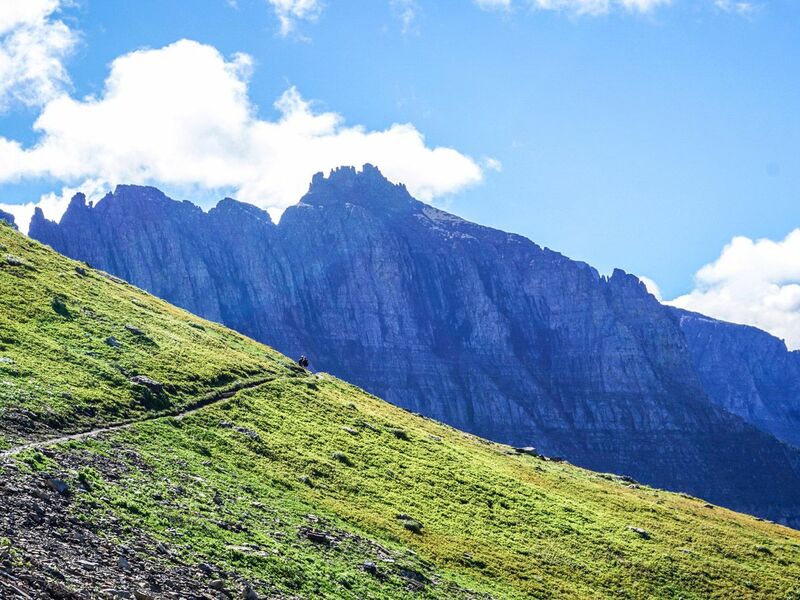 Thanks to the efficient free buses along the Going-to-the-Sun Road, you can take a bus back to your car from the trail – though make sure you know when the last bus is! 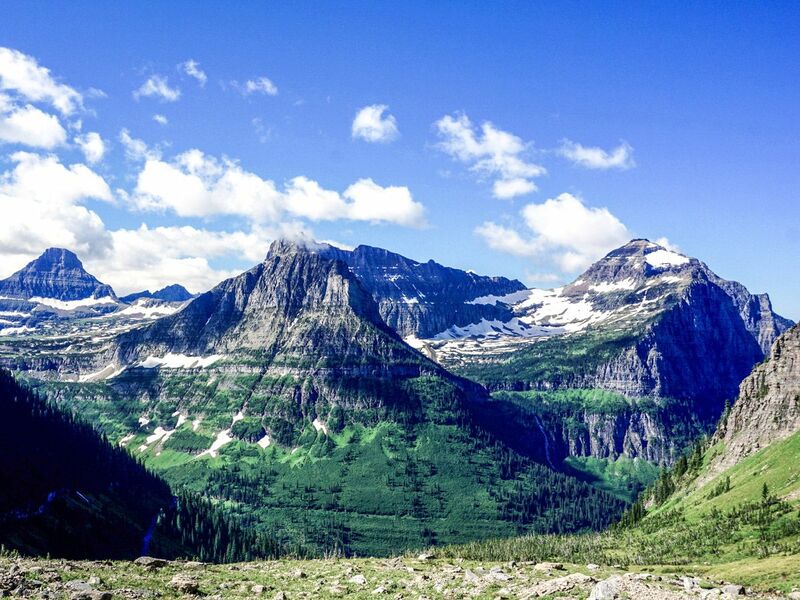 Drive the Going-To-The-Sun Road towards the famous Logan Pass and park in front of the Visitor Centre. The parking lot fills up very quickly, so plan to either arrive before 8:30am or park elsewhere and take one of the many shuttles to pass. 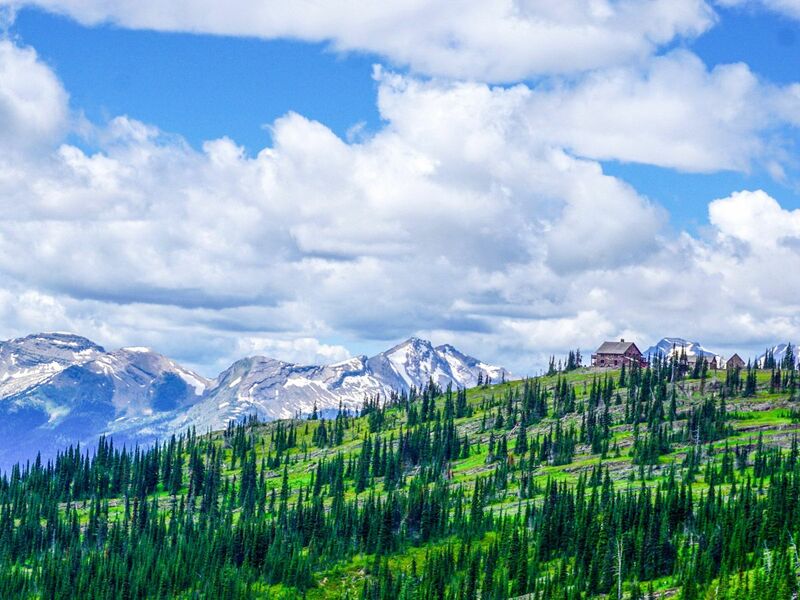 From the Logan Pass Visitor Centre, cross the parking lot and the road towards the Highline Trail sign. This hike is well signposted throughout. At first the trail passes through an alpine meadow and then hugs a rocky cliff as you hike near the road. Luckily for those scared of hikes, a wire handrail has been installed. With views across the valley of Mt. Oberlin, the occasional sound of a car is mitigated. Thankfully, after a couple kilometers of flat hiking you’ll distance yourself nicely from the road and continue to contour along the right side of the valley. You will pass over many streams. Because you start so high up, every moment of the hike has wonderful views. 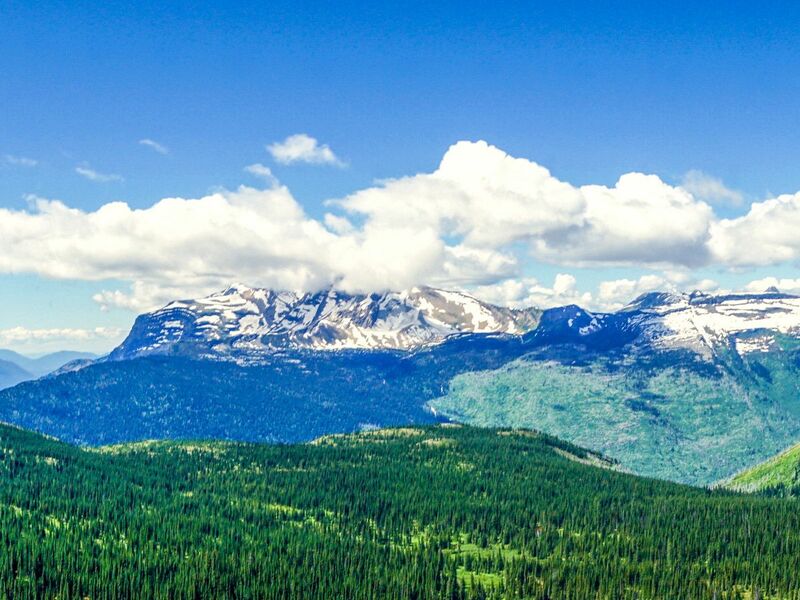 As you continue you can see Heaven’s Peak in the distance across the valley, and the views get continuously better into the cirque between Mt. Cannon and Clements Mountain. You can look to the right and see the trail approach a rocky knoll, known as Haystack Butte. Finally, after 5.0km you will start the first of two climbs of the day, up to Haystack Pass, reached at 5.6km. Completely devoid of any trees, this climb gives you stunning views directly into the aforementioned cirque as you are surrounded by gorgeous wildflowers. Usually this point in the hike many people who just wanted to do part of the trail have turned back, providing you with a little more seclusion as you continue forth. Past Haystack Pass the trail continues flat below The Garden Wall. The views remain stunning and the grade remains flat. You can finally look down a gorgeous valley to the massive McDonald Lake and get even more impressive views of Heavens Peak. Continuing along the trail, the Granite Park Chalet comes into view, with a stunning backdrop of snow-capped mountains. 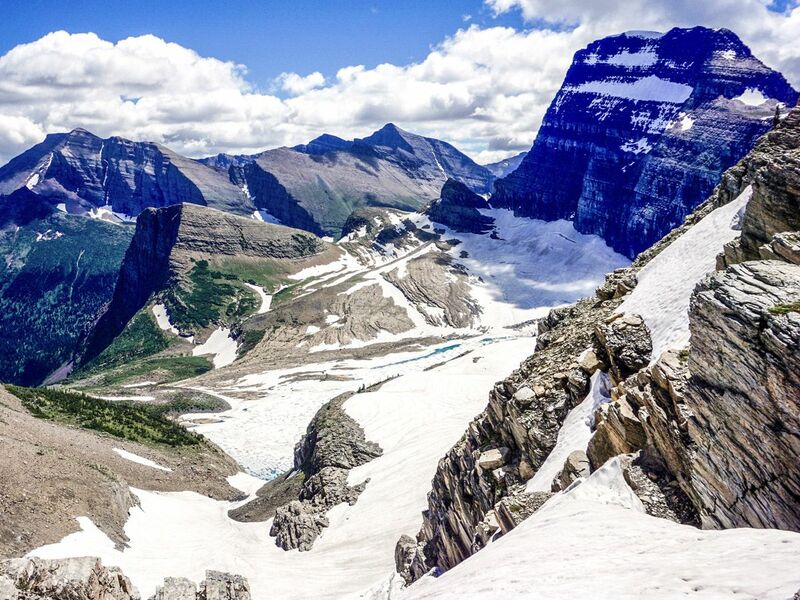 After 10.8km there is a junction, with the right-hand path leading back to the Garden Wall, overlooking the Grinnell Glacier. 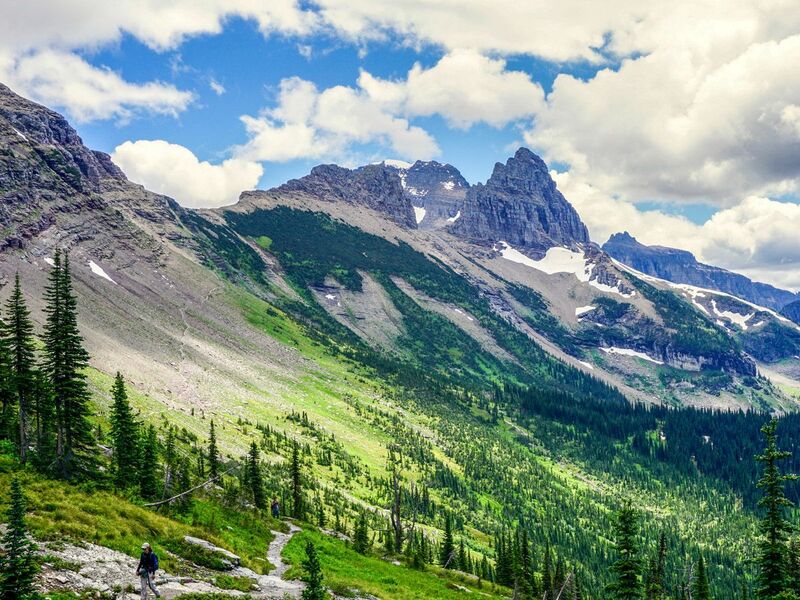 This 1.0km trail has an extremely steep climb, rising almost 300m, though the view down to Upper Grinnell Lake and Grinnell Glacier are worth the climb. 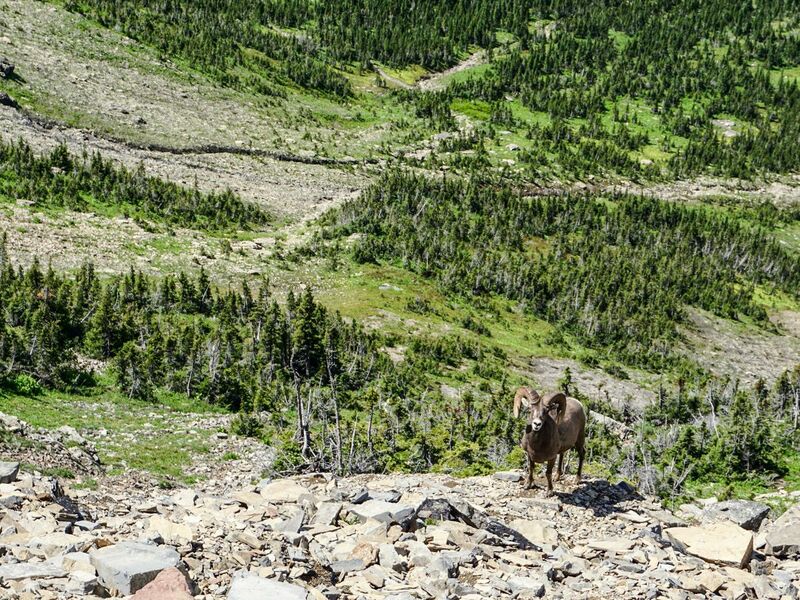 There are some Big Horned Sheep who like to hang out here and may follow you up – please don’t feed them! 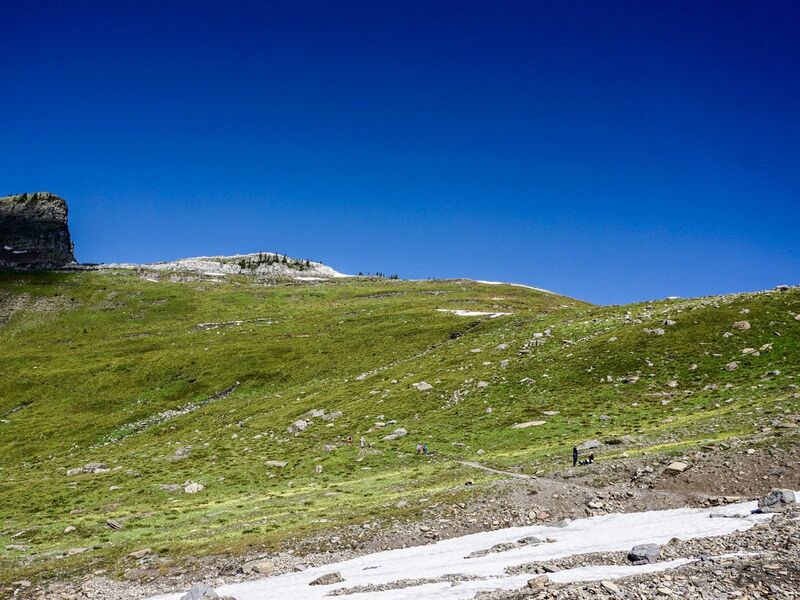 Hiking another 1.3km from the junction you will find yourself at the Granite Park Chalet. Built by the Great Northern Railway in 1914, this Chalet was built mimicking the numerous “refugios” found in the European Alps, allowing for relatively comfortable backcountry housing. Listed as a National Historic Site you can still reserve a room here, however it is more basic than the other eight built. If you are just there for the day, however, they do sell chocolate bars at a remarkably cheap rate. If you want to stay here book well in advance and bring your own food. From the Chalet, go down the Loop Trail another 6.5km down to The Loop on the Going-to-the-Sun Road. A 2003 wildfire burned the previously dense forest of the Loop Trail, giving hiking stunning views of Heavens Peak as you descend. On our most notable hike, we were greeted near the end of the trail by an adolescent brown bear, completely at ease with us while he searched for his pre-dinner snack – thankfully not hikers, but some tender roots. At the end of the trail you come to the road. Cross the road and go along the right-hand side to find the shuttle stop. The shuttle comes every 15-20 minutes and will return you to Logan Pass, or to wherever you parked your car.  Start early to ensure you don’t miss the last bus back to Logan Pass. The friendly rangers can give you that information, as well it is on the bus stops. 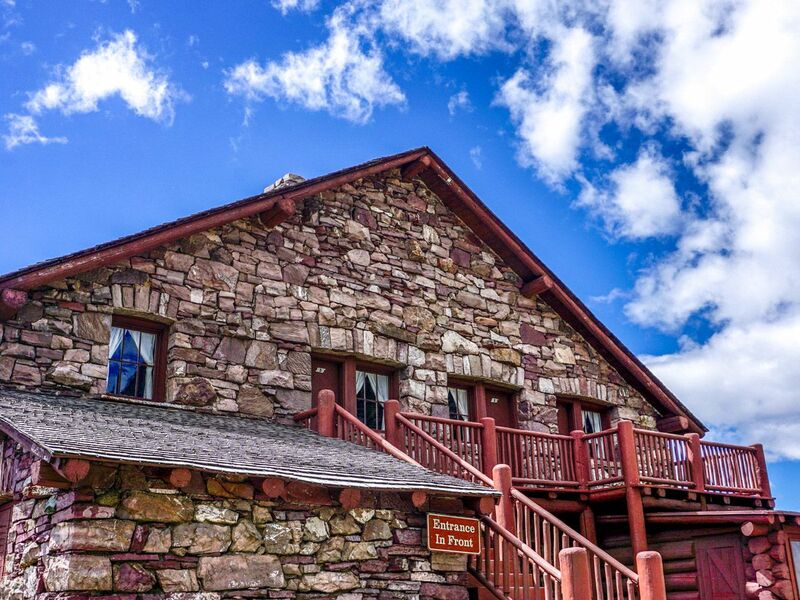 If you can, spend a night at Granite Park Chalet, but bring your own food!